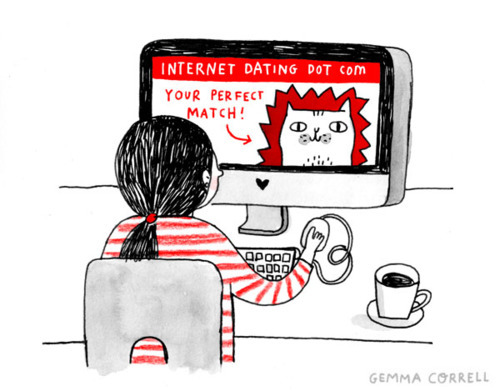 Ugh, online dating. I did that on and off for a few years and met a lot of losers, and was contacted by even more. I was on OKCupid, so there weren't as many adventurers; mostly guys who thought that, because they knew a few big words, they'd win over the hearts of any girl lacking a duck-face photo. After many, many bad dates (one guy told me on our first date that his goal in life was to knock up a rich girl and be "taken care of"--seriously), I eventually met a really great guy and we're engaged now. I know that's a really gross way of ending things, but if you can get past the ziplining, the claims of extravagant vacations, and endless male delusions, someone might be out there! Or maybe not. That cat is your perfect match--that sounds good to me. Hahah been there done this...numerous times. A guy friend I have told me...well if I've waited this long to meet someone, I want them to be perfect...WTF. And the 30 thing? Don't sweat it. I did and ended up dating someone I wasn't really into and wasting my time. I've now been single for over 8 months with no end in site--but at least I'm having a good time doing what I want with no restrictions. P.S. My cousin has really really good dating stories. are you kidding me? how does someone like you NOT find a date? good looking, intelligent and a good story teller. wow times must be tough. Lisa, I too am trying an on-line dating service. It's not as bad for the guys evidently, but I've already been hooked up with a scammer who probably isn't even a woman! I'm currently playing along with her scam just to see how it works. I'll stop when the money requests start, which should be tonight or tomorrow. It's quite educational. I'm lucky the on-line dating service itself discovered "her" deception and informed me. Don't think she could have conned me out of my money, but she was starting to worm her way into my heart. Luckily it was not yet deep enough to be devastating. Sad really. You should go on the show Catfish! Good luck with that. I hope you find someone legit. Lisa, you are singing my song. This is what I discovered online dating: the women are infinitely better quality than the men. That is to say, there are really great girls online but the guys are weird, rude, crazy, ugly, etc. Good luck lady, you can read about my friends and our online dating at: www.bonerintheback.wordpress.com -- maybe it'll help? I found this Blog as I searched for stats/horror stories related to Match. I enjoyed the wit, the read and you appear to be quite the catch judging by the flavor of your writing and the picture. Obviously smart, sarcastic, funny and easy on the eyes. Huge wins anywhere. I live in and love Montana and I go do something active EVERY weekend. I have the benefit of 57 mountain ranges, rivers and streams too numerous to count, badlands, prarie, and a diversity of wildlife that is unrivaled. I would be a failure at life if I didn't get out every weekend and float, hike, bike, snowshoe or just sit in seemingly never ending landscape and read a book. I was in Tanzania the month of January, I will be in Honduras next January. I am 40 this year, but have managed an international trip nearly every year since I was 30. I am just writing because there are guys that do those things that 99% of Match guys say they do. In doing what I love, I find that meeting women with like interests is much easier than logging onto Match could ever possibly be. Oh and I play all the sports too, so I guess I am the 1% that would have to try a different angle on Match since the 99% wish they were me. Go do what you love, where you love and the dating opportunities will line up at your porch. Or move to Montana where we don't appreciate online dating but we do appreciate intelligent, creative,and beautiful women. Aww aren't you being a little tough on the guys? I checked out match and some other sites, and the girls are every bit as guilty of it as the dudes (except Justin, who appears to be the genuine article.. uh huh). You'd be astounded at how many "outgoing, athletic, adventurous, country music enthusiast" females there are out there. Combing through pages and pages of profiles all utterly bereft of even the smallest semblance of individuality or personality was enough to make me scream. I promptly severed all ties to match. Oh and I totally feel you on that biological clock thing.. except in my case it's hair follicles, muscle mass, and a functional prostate.